I was very kindly sent these two products to review, click here to read my full disclaimer, honesty as always. Before receiving these products I had never tried anything from this brand and I hadn't really heard of them. The Herbalife products cannot be bought online or on the high street, they can be purchased through distributors and members - check out the product links to find a distributor near you. 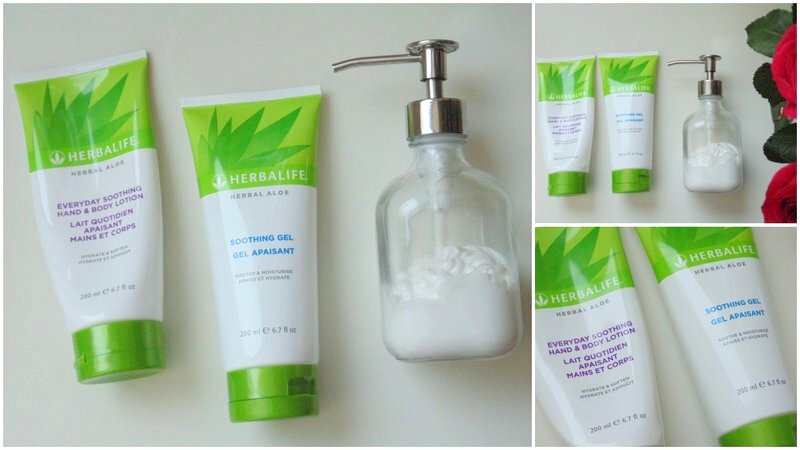 *Herbalife Herbal Aloe Everyday Soothing Hand & Body Lotion (£8.63, 200ml): I am not sure how much these items cost and I cannot really find a UK online shop selling these products - I will update when I find out! I have transferred the hand and body lotion to a pump container that I bought from Ikea just because it makes using body and hand lotion so much easier and more convenient. Although I do like the packaging of both Herbalife products. The lotion has a very fresh, aloe scent which I like especially for this time of the year. It feels very light and refreshing on the skin and it absorbs really quickly! As the lotion is quite light and fast absorbing I thought that it wouldn't be very moisturising but it is surprisingly. It is not as moisturising, in my opinion, as a thick body butter but it is quite impressive. It leaves my skin smooth, soft and moisturised with out being heavy or greasy. ★★★★★, 5/5. *Herbalife Soothing Gel (£8.63, 200ml): I have been using this along side the lotion when I shave as I can get bumps and my skin can be quite irritated after shaving. I do not use anything lotion or gel immediately after shaving as I find it can irritate my skin even more. But I use this gel the day after and it feels light and fresh as the lotion does. It also absorbs really quickly and doesn't irritate my skin. You only need a small amount of each product - overall, I am pleasantly surprised. ★★★★☆, 4/5. Have you tried anything from Herbalife? What do you think of these products? Labels: aloe body lotion, bblogger, beauty, herbalife hand and body lotion, herbalife soothing gel, ikea container, ikea pump dispenser, soothing post shave gel. Categories: aloe body lotion, bblogger, beauty, herbalife hand and body lotion, herbalife soothing gel, ikea container, ikea pump dispenser, soothing post shave gel. Never heard of this brand before but it looks great!